Vanderbilt-Ingram Cancer Center (VICC) has been selected as one of the few authorized treatment centers in the United States approved to administer the first FDA- approved chimeric antigen receptor T cell (CAR T) therapy for treatment of adult patients with a specific type of lymphoma. VICC is the only cancer center in a seven-state region of the Southeast authorized to deliver the new immunotherapy. On Oct. 18, Kite, a Gilead Company, received FDA approval for its CAR T therapy Yescarta™ (axicabtagene ciloleucel), a breakthrough in hematologic cancer treatment in which a patient’s own immune system T cells are engineered to seek and destroy cancer cells. CAR T therapy is manufactured specifically for each individual patient. VICC has been administering Kite’s CAR T therapy to adult patients participating in the ZUMA-1 clinical trial. Yescarta is approved for the treatment of adults whose cancer has recurred following at least two other forms of treatment. Specific types include large B-cell lymphoma (DLBCL), primary mediastinal large B-cell lymphoma (PMBCL), high-grade B-cell lymphoma, and DLBCL arising from follicular lymphoma (transformed follicular lymphoma, or TFL). Diffuse large B-cell lymphoma is the most common aggressive non-Hodgkin lymphoma (NHL). While chemotherapy or stem cell transplant is effective for some patients, the cancer often recurs, and with the current standard of care those patients often have a median overall survival of about six months. Now those patients have another treatment option. In the ZUMA-1 study, 72 percent of patients treated with a single infusion of Yescarta responded to therapy (overall response rate) including 51 percent of patients who had no detectable cancer remaining (complete remission). VICC’s first clinical trial patients were treated with Yescarta nearly two years ago and nearly all of them remain in remission from their disease. 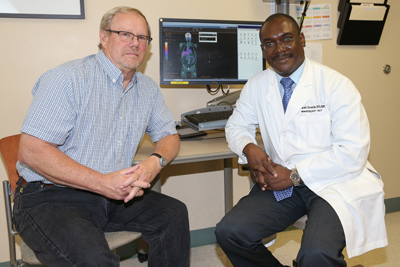 Olalekan Oluwole, MBBS, MPH, assistant professor of Medicine,led the clinical trial for VICC. “I think it is safe to say that these new CAR T therapies will become part of what we do on a day-to-day basis to treat lymphoma. They have clearly made opportunities available for people who normally would have few viable options. Because of the way this new immunotherapy works, this technology has actually moved the field further towards eradicating cancer,” said Oluwole. Donald Pender, 67, a retired GM auto worker from Spring Hill, Tennessee, was the second patient treated at VICC. He had already been treated with chemotherapy and a stem cell transplant, but his non-Hodgkin lymphoma came back and he decided to take part in the clinical trial for the new CAR T therapy. “They knew this worked but didn’t know if it would work for me. I wanted to give it a try. I thought I don’t have anything else to lose, let’s go for it,” said Pender. His cancer is now in remission and he is grateful that the clinicians at VICC offered him the chance to participate in the trial. “It’s a special place, it really is. If there’s something going on in medicine, they’re doing it,” said Pender. Because there are potential severe complications involved with this type of therapy, all treatment sites like VICC must have special certification acknowledging that the center is able to handle these risks. The most severe and potentially life-threatening side effects include high fevers, low blood pressure and brain swelling that may require care in the intensive care unit. This is the second CAR T immunotherapy that will be available to Vanderbilt patients. Monroe Carell Jr. Children’s Hospital at Vanderbilt is part of a select group of health care institutions recently chosen to offer a new FDA-approved immunotherapy for a subset of pediatric acute lymphoblastic leukemia (ALL) patients. Kymriah, which is manufactured by Novartis, was the first gene therapy approved by the FDA. Patients and physicians who have questions about the CAR T therapy for adults with diffuse large B-cell lymphoma may call 615-936-2702.